One of the most proffered solutions to prevent infection due to drinking of contaminated water is to boil the water, allowing it to cool down before drinking it. 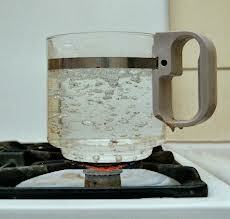 For most people, even the cleanest water is not good enough until it is boiled. Historically, this is the best way to purify water and the practice is still very popular today. However, the practice is not entirely safe. Past and recent evidences abound to prove that people who drink boiled water after cooling down usually end up contracting infections, and in some cases, fatal ones. While many people would disagree with this reality, microbiological facts have shown that indeed, boiled water can be dangerous than even the untreated one. Most microorganisms usually avoid/survive harsh environmental conditions like unfavourable temperature and lack of food, by protecting themselves in a cocoon-like structure called spores, except this cocoon is so resistant to majority of the conditions that would have killed the organisms if they are exposed. They are resistant to heat, acids, antiseptics and some disinfectants. Microbes like Escherichia coli and Samonella typhi, respectively major causes of gastroenteritis and typhoid fever, are some of the notorious microbes that produce spores. What’s more? The two organisms are readily transmitted in water. When raw water is boiled, the naked organisms are killed. But their spores, which are protecting some organisms inside will survive. However, the resultant hot/warm environment created by the boiling will create an incubating temperature for the spores, leading to the spores ‘hatching’ and the release of the microbes into the water when the water has cooled down. This warm environment may also lead to proliferation of the microbes and a resultant increase in their population. Hence, most of the times when one is drinking cooled boiled water, one is possibly taking in an enormous population of enteric bacteria which are capable of causing fatal gastro-enteric infections. This is what led early microbiologists to develop a process called tyndallisation, a method of sterilisation that is named after its inventor, John Tyndall. This process involves boiling water for 15 minutes for consecutive three days. This will allow the spore to have ‘hatched’ into bacterial cells on the second day which are then killed by the second day boiling. The third day boiling kills any bacteria that developed late from the spores. This simple technique, though old and not 100% efficient in water sterilisation, is still very effective in preventing water-borne infections. A newer and more efficient method is to use pressurised heating. This involves the use of equipments which can produce steam under pressure like the autoclave and pressure cooker. The water is simply being boiled at 1210C for 15 minutes. While monitoring the temperature may be easy when using the autoclave, doing the same with pressure pot is not be that straight-forward. Experience has however shown that the ‘whistling’ of the pressure pot three times indicates a temperature around 1210C. After this whistling, the boiling is allowed to proceed for 15 minutes and left to cool down. What is now left is sterilised and clean water 100% certain of being devoid of any microbe. At least that was the result the last time this process was used. One would never know when more stubborn, extreme, thermophilic microbes that are pathogenic would be discovered. But until then, we are relatively safe.